Custom Orders now only available through my website (direct link in my About page). 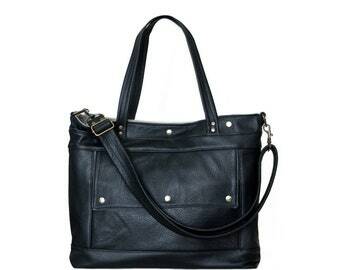 All my leather bags are made with premium full-grain genuine cowskin leather, typically used in high-end upholstery. Do note that because these leathers are minimally processed leathers (they are not corrected), they retain the beautiful natural markings in the hide before tanning like branding, scars, bite marks, fat wrinkles, etc. While I try to place these natural markings on the back, bottom, and discrete places around the bag, I do not throw away all of these parts of the hide unless they compromise the structural integrity of the bag because I believe in minimizing waste and using the entire animal. These "blemishes" that add character to each bag and also is the signature to a leather lover that it's high-quality genuine leather! I was pleased with the amount of leather I received for 2lbs as well as how quickly the item shipped! I rated 4 star only because I would have liked to have more of a variety of color but I was given an assortment and I was happy with it! But 4 star only because of that reason. Otherwise it was great! Absolutely gorgeous!! Several very large pieces in the lot. This is an amazing value!! Great variety and quality leather. This was perfect for my DIY night! Will for sure order again! Looking for high quality upholstery leather for your next leather crafting project? Try 2 lbs of Earthtone leathers from my shop! 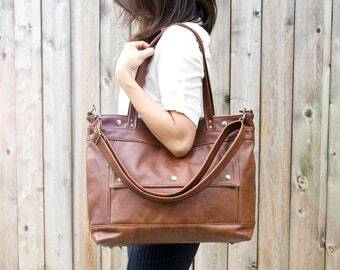 You'll get a beautiful assortment of leathers I use for constructing my bags! Today is the last day to get 10% off your order from my shop, including custom bags. It's also the last day to place your order in time for Christmas delivery within the US. Use code GIVETHANKS at checkout! 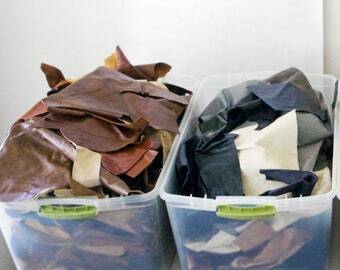 2lbs of cool tone leather scraps, in the shop now! Me on the office/sewing side of the studio. While I sew, I am just a twirl away from answering customer emails! Deadlifting my-size bolts of canvas lining onto my cutting table keeps me in shape while working. Using highly-proprietary construction methods, like cutting with scissors and sewing straight lines. Freshly stamped leather logos, ready to be sewn onto my bags! I photograph my bags in my sunlit studio either on my cutting table or my mannequin to show size reference. You can view my entire collection at my shop website (link below). Thank you Etsy for making me a Featured Shop! I have always dreamed of being an artist, but my parents gave me two options for my career: become an engineer or a doctor (and do the artsy stuff on the side). I chose to be the ultimate parent-pleaser, a biomedical engineer. Then, I rebelled and did my artsy thing during lecture -- sketching designs and reverse engineering them to make templates (hey, the schooling came in handy). I started my business on Etsy in 2008, out of my dorm on a simple sewing machine, sewing simple fabric totes. I couldn't have done this without the help of my husband, Shay, who is also my unpaid manager, analytics guy, and male model (if I nag him enough). He is my steady source of sanity and is always there when I need help making big business decisions. Oh, and Hubert, too. He's our goofy pug who keeps me company with his steady snoring cadence around the studio. For the record, my parents (and in-laws) are really proud of me. I win! Shay is my steady source of sanity and operations/strategy guy. He also models if I nag him enough. He has a BS in Electrical Engineering from Georgia Tech and an MBA from Carnegie Mellon University's Tepper School of Business. Hi, I'm Jenny Nemlekar, and I design and hand make every bag that comes out of my studio in Dallas, TX. I make each bag with great care, attention to detail, and love. Discounted are FINAL sales and not eligible for return or exchange! 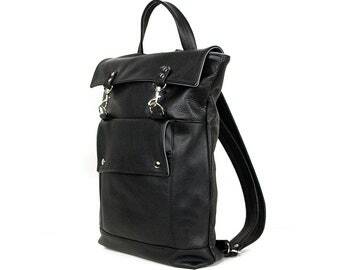 Made to Order bags can be returned or exchanged within THREE (3) days of its delivery for refund less shipping fees I paid to ship the bag to you. See below for details for return. Read dimensions carefully to ensure the product works for you. Note that colors vary from monitor to monitor settings and this is the nature of buying from an online business. If you would like a leather or fabric swatch, message me for details. 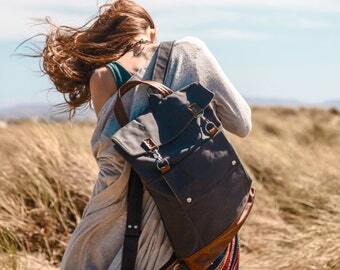 All my leather bags are made with premium full-grain (aniline and semi-aniline) and some top-grain genuine cowskin leather, typically used in high-end upholstery. Do note that because these leathers are minimally processed leathers (they are not corrected), they retain the beautiful natural markings in the cow hide before tanning like branding, scars, bite marks, fat wrinkles, etc. While I try to place these natural markings on the back, bottom, and discrete places around the bag, I do not throw away all of these parts unless they compromise the structural integrity of the bag because I believe in minimizing waste and using the entire animal. These "blemishes" add character to each bag and also is the signature to a leather lover that it's high-quality genuine leather! Payment is due in full at time of order. Order cancellations are accepted within 48 hours of purchase unless order has been shipped. If order has been fulfilled and shipped, please see REFUND POLICY below. Orders over $200 are shipped with SIGNATURE CONFIRMATION (someone must be present to sign for the package at time of delivery). Sale bags, Swatches, and Leather Scraps ship within 3-5 DAYS of cleared payment. Made-to-order items ship within 3-4 weeks (sometimes earlier!). Please see shipping delivery times for total time before the bag reaches you. Items are shipped to your Etsy address. All bags ship INSURED via USPS Priority with delivery confirmation. Delivery time takes 1-3 business days. All bags ship INSURED via USPS Priority International with delivery confirmation. Delivery time takes 7-14 business days. I am not responsible for import taxes and duties that may incur for international orders. All international orders are marked "Merchandise" and will not be marked as "Gift" as this is illegal for my business. Please check your customs policies to ensure safe delivery. I do not place holds on any of my items. Because I do not have a storefront, I do not offer local pickup. However, I do ship FREE! I do not wholesale or consign. Please message me with any questions or concerns. I'll be happy to answer them!